State run telecom company Bharat Sanchar Nigam Limited (BSNL) has launched new FMC Broadband plan with bandwidth speed upto 2Mbps for limited period as promotional basis under BSNL Wimax Broadband Services. The Competent Authority of BSNL has introduced FMC (Fixed Monthly Charges) Wimax Broadband plan know as ‘WI Rs.399/-’ across Punjab Telecom Circle for limited period 90 days as promotional basis under Wimax Services. This plan is applicable for all users with option Single users and Rs.250/- will be charged for activation/installation charges. On activation of Wimax broadband plan customer will get 2.5GB Free data usage per month and Additional usage beyond free limited charges 1ps/100KB. 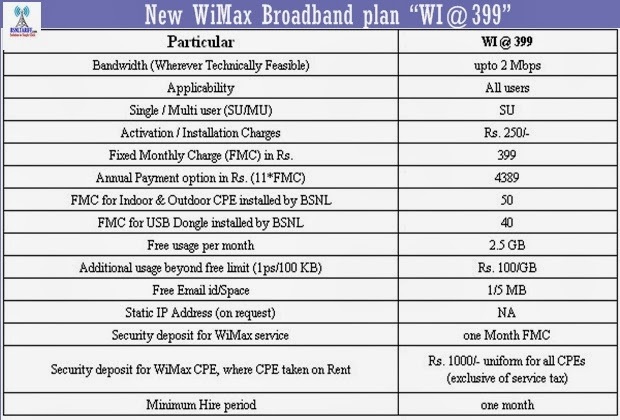 The customer who applied or migrate to Wimax Broadband plan Rs.399/- have annual payment option for 11 months i.e customer have to pay Rs.4389/- only for 11 months rental fees instead of Rs.4788/- means one month free by following terms and conditions. The above plan will be implemented and with effect from 02-12-2013 for 90 days (from the date of activation).